Kindergarten teacher Lucy Sullivan has an Irish temper, a fierce love for her students, and a growing fondness for fellow teacher Glen Daniels—until plain-spoken soldier Alex “Ace” Evans comes into her life, quite literally saving it. As they struggle to rescue five little girls caught in a flooding school, will these two opposites find the love missing in both their lives—or even survive? The stunning story that introduces the brilliant new series of romantic suspense, intrigue, and humor, Extraordinary Days, by novelist Polly Becks, making her debut in women’s fiction. No Ordinary Day tells the tale of an epic tragedy that changes life forever in a small town in the wild, mystic Adirondack Mountains of upstate New York, especially for eight special women, and the mystery that surrounds it. 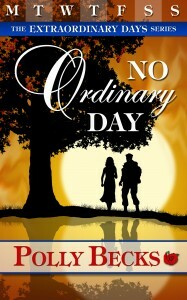 Set against the background of the magical forested mountains and unique towns and cities of the Adirondack Park, No Ordinary Day introduces both the place and the characters of the rest of the Extraordinary Days series, which is thereafter set in present day. Read No Ordinary Day today! Each book in the Extraordinary Days series makes a direct cash donation to a different charity or non-profit organization. Every purchase or download of No Ordinary Day benefits The American Red Cross, dedicated to helping people in need throughout the United States and, in association with other Red Cross networks, throughout the world since 1881.